Please read our rules and submit your info. We will be in contact shortly. Thanks! New D-Factor format: Contestants will be competing for the grand prize. One contestant will be eliminated every week. 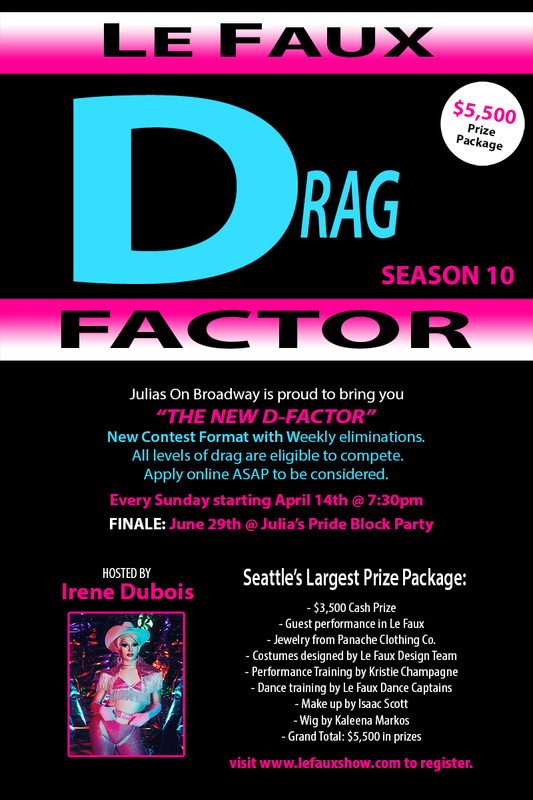 All finalists will compete in a final show for the D-Factor winner on June 29th at the Julia's Gay Pride Block Party event. Judges and the audience will choose the final winner. 2. No water or fire on stage. 5. Bring your performance music on a fresh CD or flash drive in MP3 format only. No other formats will be accepted. 6. Cannot be under the influence of any substance or will be disqualified. 8. Must be able to perform every week for the duration of the show until eliminated. A. Contestants will perform to two musical numbers. We want to see something different for each number. D. Judges are looking for performances which have a combination of dance, style and lip-synching skill. E. Judges want to see you have more than one look. It would be advised to come prepared to show your drag versatility. - Winner must understand that they will be made over according to the decision of the Le Faux director. - Le Faux director will decide if we will remake you as a character impersonation or a drag personality. You must be comfortable with both. - Winner must agree to all the changes required by the Le Faux primaries. - Winner must be willing to let go of previously learned skills in order for Le Faux primaries to recreate your drag. - Winner must be flexible with schedule in order for us to complete all of the pieces required to remake you. - Winner must attend all scheduled rehearsals as agreed upon. - Le Faux primaries will give status reports to the director on your progress and your willingness to accept change. - This contest is designed to help performers reach their maximum potential. Which will require you to give your full cooperation during the entire process. - If winner is unable to fulfill all of these obligations, the director reserves the right to end this agreement at any time. - Weekly contestant will receive their prize only after competing in the finals. Winner will receive their prize after the completion of the makeover process. - Weekly winner will perform at Julia's Queen Of The Brunch as a tip spot. Must be ready to go 30 minutes prior to show start. If you show up late, you will be disqualified. YES, I have read the rules and performance tips and I agree to the terms. I am able to perform all weekly shows or until I am eliminated.